If you are starting a t-shirt business you need designs to print on your t-shirt and for that, you need to hire a graphic designer. A lot goes into designing a good t-shirt, but the designs need additional attention. Although the quality and fit of your t-shirt will determine how happy your customers will be; the illustration will attract a user’s attention and lure to buy in the first place. 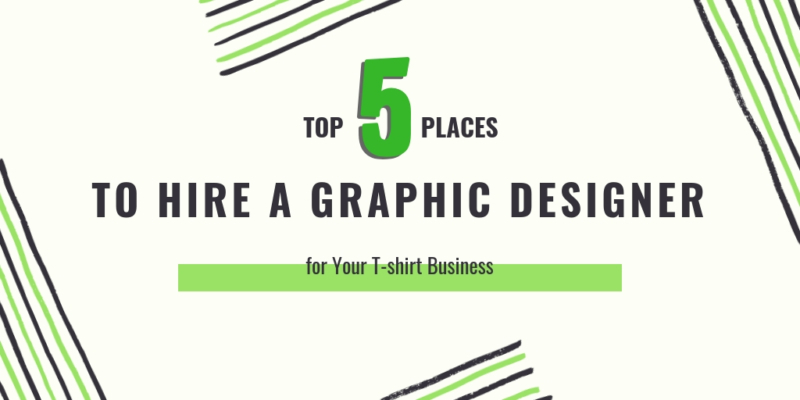 Today, we are going to share five such online resources where you can get a graphic designer for your t-shirt. You need professionals and designers who have experience in the industry. To make you meet your designer we have created here a list of 5 websites from where you can get your graphic designer cost-effectively without having to hire one for yourself. At Dribbble you will find many passionate designers. It is more like a social network for designers than a storefront. It naturally attracts designers who honestly want to perfect their craft and create a fanbase and not really looking to get paid. However, it brings in a lot of new artists who are serious about their craft and are getting started to make a name for themselves. Many of them are great at their skill and usually, work at a discounted rate only to get some experience. If you could find a designer whose work you like and he/she doesn’t have a large following, you can get a really great deal. However, to actually hire a graphic designer on Dribbble, you must purchase the Pro Plan which will cost you either $49/month or $199/month as per your subscription. If you are on a tight budget, this is the perfect place to start with. As the name suggests, most services start at a $5 price point, however, they have more expensive options and additional features. This is also probably the best or the worst place to find designers. Make sure to check out your designer’s previous work before hiring. If you could really find a designer for just $5, it’s a jackpot. Fiverr users are demanded that they define their work precisely. This way, you don’t have to waste time communicating with a designer to figure out if your project fits within the area of expertise or not. On other sites, you may try to hire a graphic designer but they may not be doing artwork for t-shirts. On the other hand, in Fiverr, you can get a t-shirt graphics designer at a great price point. Behance has a portfolio of a wide range of artists and offers awesome search features with tags that make it easy for the owners to find exactly the designer they are looking for. It offers tools to enable owners to post a job and have designers apply for it. Create a post detailing exactly what you need such as in the sites like Craigslist or Indeed. Here you will get applications from users whose portfolios and ratings are open to you. It is much like Fiverr where anyone can sign up as a freelancer or post a job. However, users don’t have to display a portfolio of their work. It has a decent rating system and has its own algorithm that will try to match you with freelancers it thinks will be perfect for you. However, it does tell you how many projects a freelancer has completed through the site, which will tell you what kind of work they have already done. It has a radical approach if you want to hire a graphics designer. It uses the power of competition to give you the best designer. Here you don’t hire freelancer right away, rather you launch a project through the site and create a contest. In the contest, the users submit their finished products to you based on the instructions you provide. And when it’s done, you only pay to the designers whose work you like. If you didn’t like anybody’s work, you don’t have to pay at all. It gives you an opportunity to try out a number of freelancers at a time.